The final round of the Portland Area League’s 6-Round Swiss System tournament came to a conclusion on Wednesday December 14th. Top seeded Clackamas High School was pitted against the young upstarts from Sylvan Middle School. The match started promptly at 4 PM and from the start it appear that the upper-classmen of Clackamas were going to have a very good night. Winning first on board 4, then on board 5, and then on board 3. The top 2 boards looked fairly even for most of the night, but then both of the Deng brothers (Clemen on board 1, and Leo on board 2) made great use of their remaining Knights to win both games. Westview and Wilson High Schools were both hoping that Sylvan could upset Clackamas and that one of them would get to claim a share of first place. Both teams fought hard to win the match. Eddie Wang of Westview and Dillon Murray faced off on board 1, but since neither could find a win the game ended in a draw. Wilson’s Nathan Jewell won on Board 2, but Westivew’s Jimmy Nguyen evened it up on board 5. Westview took the lead with Lamson Vu’s victory on board 3. Unfortunately Wilson’s board 4 was a no show – time forfeit giving Westview a 3 1/2 to 1 1/2 match win. With over 20 teams in the League the coaches knew we did not have time to play a Round Robin Tournament where everyone meets everyone. Additionally, since many of the schools had multiple teams it really did not make sense for a school’s number one team (consisting of the top 5 players) to face their second team (consisting of players number 6 to 10) or even less to have them face their third team (consisting of players number 11 to 15). The coaches decided prior to the start of the season to utilize the Swiss System for the first half of the season. The Swiss System is great for its ability within a relatively small number of rounds to end up with only one prefect score. True to its reputation there was only one prefect score after 5 rounds, and after 6 rounds we had a clear first and second place. However no real clear third place with 6 teams with 4 wins. The coaches also decided that the order of the teams finish would help to determine placement in the second half Round Robin sections. So in 2012 the League will be split into three different 8-Team sections and will play only 7 rounds ending just prior to the Oregon High School Chess Team Championship. Chess players in grades 6 to 12 to join are welcomed to come to Lincoln HS (when Portland Public Schools are in session) at 4 PM to join the fun. Every week we have an “Extra Game” section with registration closing just after 4 PM (the start of League Plays) and your welcome to play in that section without restriction. Additionally some of the teams would welcome additional players (our rules allow each school to have up to two — players that are not their students). What does this mean — Well for example if you go to David Douglas High School (a school not in the League) you could still be placed on an existing team. The Albany Open on Dec 10-11 was a lively affair, with an abundance of sharp, entertaining, and well-played games. It was a friendly, diverse group of players–from primary school to retired, from Eugene to Seattle and Pendleton, from provisionally-rated U1100s to the strongest players in the state. Overall, a very fun event. In the Open section, Steve Breckenridge took first place with 4.5/5. Steve graduated from HS a year and a half ago and is well-known to the Oregon scholastic crowd because of his many OSCF championship titles and his fantastic work at the OSCF championships in Seaside last year–especially the ongoing simuls he played in the skittles room. After Albany, Steve will also be known as the highest-rated (2323) Oregon player. Nick Raptis (2292) had other obligations Sunday afternoon and could not play the final round, but in typical Raptis style his performance prior to the last round was strong enough to earn him clear second place at 3.5/5. Nick contributed enormously to the success of the event by helping recruit the top four players in the tournament. Mike Montchalin (2177) is a five-time former Oregon state champion but hadn’t played a rated game for eight and a half years before coming out of retirement in November. He showed little signs of rust as he scored 3/5 to tie for third. Also tying for third at 3/5 were Mike Schemm (2004) and Calvin Parnon (1889). Calvin played wild, interesting, and strong chess to take the U2000 prize and move up to #2 among scholastic players in the state. In the Reserve section (U1800), Yogi Saputra (1220), a student at West Albany High School, outshined significantly higher-rated players to finish in clear first at 4.5/5. Close on his heels was Fred Davis (1646) in clear second at 4/5. Maurice Maynard (1506) from Salem scored 3/5 to finish in clear third. The U1600 prize went to Praveer Sharan (2.5/5) and the U1400 went to Alathea Letaw (2.5/5). Full results can be found at USCF. 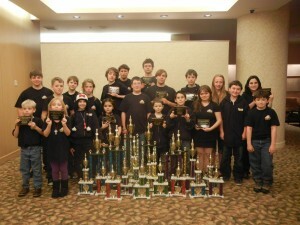 Coquille Chess Club players with their 22 trophies. Back row left to right: Tanner Flood, Mason Collard, Vincent Thrash, Tianna Huffman, Dane Ramirez, Matthew Crim, Isaiah Hill, Donovan Taylor-Blower, Aaron Grabinsky, Hailey Riley, Sarai Perkins Front row left to right: Johnathan Huffman, Mackenzie Collard, Sam Huffman, Angelina Morones, Kaden Johnson, Joshua Grabinsky, Josiah Perkins, Jessi Ross, JJ Newman, Jordan Henderson. Twenty one Coquille chess players collected twenty two trophies at the National Youth Action 2011 Chess Tournament December 10th and 11th in Irvine, California. The Coquille contingent played great, and the K-9 team even managed to place second at this national event! The trip started with a sixteen hour drive down to Stanton California the day before the event. Players met at 4 a.m. Friday to begin the trip. The adventure included one kid sick on highway 42, engine troubles on another vehicle, getting lost when mistakenly following a vehicle not in the carpool and navigating seven-lane highways in downtown Los Angeles. Eventually the 21 players and 8 chaperones arrived in the late evening exhausted and got a night of rest. Saturday and Sunday were nine intense, rapid-paced games (each player was limited to 30 minutes only each per round) at the Hyatt Regency. Two of the K-9 players had a chance to play renowned Grand Master and former women’s world champion Susan Polgar’s son Tom Polgar-Shutzman (rated 2033). Sarai Perkins held her own but grew too nervous as Susan avidly watched. Eventually, she cracked and made a mistake, costing her the game. Aaron Grabinsky, however, earned a draw against him. Many of the players in the top sections were near Master level, so competition was tough. There was also an evening Blitz Tournament where players had only five minutes each to complete their game. At the awards ceremony, the master of ceremonies was quickly corrected on how to pronounce Coquille and he got plenty of practice saying it as a total of twenty two trophies were awarded to the Coquille players and teams. With a U-haul trailer (that had been rented for coolers of food, sleeping bags and luggage as all car pool seats were filled), they were able to transport all the trophies home. However there were more adventures for the trip home as one of the carpool vehicles blew an engine, fortunately only 3 hours from home. Transportation from home was recruited and the kids are all now safely home, exhausted but proud. Full results for the G/30s are posted at USCF. Blitz results are also at USCF. The Portland Area League held the 5th round of their first half Swiss System Pairing Team Tournament on December 7th. Clackamas faced off against Lake Oswego on the top boards. Clackamas narrowly escaped with a 3 1/2 to 1 1/2 victory, All five of the boards were contested hotly as these two teams have certainly become rivals over the last few years. Lake Oswego took an early advantage on board one after Clackamas’ Hai Dao misplayed the opening allowing Lake Oswego’s Joel Porter to win a pawn. Joel not content with only a pawn decided to sacrifice a stranded Knight for another two pawns. Hai was able to turn the tables and with both Kings still in the middle of a wide open board found a checkmate. On board two Clackamas’ Gavin Megson doubled up Lake Oswego’s Gabe Petegorski’s queenside pawns and found a neat little pin that allowed for the win of a pawn. Gavin then converted his advantages into a Queen and Pawn endgame to bring home the win. On board three Clackamas’ Kevin Rhine luanched an attack on Lake Oswego’s Pranav Sharan’s Kingside completely overlooking Pranav’s Queenside attack that turned into a deadly discovered check that brought an aburpt finish to all of Kevin’s resistance. On board four Lake Oswego’s Patrick Butenhoff held off the much higher rated Kevin Phuong of Clackamas ending in a 45 move draw. On board five Clackamas’ Brian Lucero took control early to defeat Yuriy Kamsha of Lake Oswego. Cleveland lost another close one by 3 to 2 against Westview. Jesuit fresh off their win over Lake Oswego was surprised by middle school kids from Sylvan by a score of 3 1/2 to 1 1/2. Wilson took the top four boards from Sherwood thereby winning by a score of 4 to 1. LaSalle had an easy time against Sherwood’s depleated second team winning on the top two boards and getting the rest on forfeit. December 14th the final round of the first half Swiss will be played. The following matches will help determine the top places: Sylvan against Clackamas and Westview against Wilson. If your in grades 6 to 12 and want to join in on the Wednesday night fun send Ed Addis a message at chessalot@aol.com. Registration is now open for the annual January Tournament the 2012 Metzger Winter Classic at Metzger Elementary. The tournament will have multiple sections and an OPEN 1200+ G/60 Section with CASH PRIZES. In addition to the individual awards, this year’s event will have a new TEAM Competition and an ALL GIRLS SECTION! Plenty of awards to go around with top 2 teams in each division receiving trophies, top 5 in Knights, Bishops, Rooks, and Queens plus sportsmanship awards. Team trophies will be determined by the top 4 players point totals in each division with a minimum of 2 players to qualify. For more information contact Jeff Risher at jeff.risher@yahoo.com or Register Here. The Corvallis/Albany Open is Saturday and Sunday, Dec 10-11. The event is designed for any player who is comfortable with long time controls (40/90 SD30 on Saturday, 40/120 SD60 on Sunday). Players rated below 1800 may play in the Reserve Section for prizes totaling $675. If you are rated well below 1800, no problem. There are substantial cash prizes for top finishers in the Reserve section, and there are also prizes for top-scoring U1600 and U1400 players. Several players rated 850-1250 have already registered, and there will certainly be plenty of players 1400-1799 as well. Masters (rated 2200+), Experts (2000-2199), and Class A players (1800-1999) play in the Open section for prizes totaling $675 ($300-200-100 for 1st-3rd and $75 for top U2000). You can register online or register at the door (although participation is limited to the first 50 paid registrants, so pre-registration is recommended). Entry fee: $40. The Portland Area League held their fourth match of the year on November 30th. The League is using the Swiss System pairing system, so only three teams remained with perfect 3 and 0 records. Clackamas prevailed over Cleveland by a score of 3 1/2 to 1 1/2. On first board Gavin Megson was able to win an even endgame when Elena Allen moved her King to the wrong square on move 41. To her defense both players were getting short on time as this was the last game to finish. On second board Kevin Rhine managed to get a draw after he got into trouble early and was most fortunate that Ben Halverson missed a crushing 18th move. Jesuit surprised much higher rated Lake Oswego by a score of 4 to 1 losing only on board 4. Sylvan middle school had a great week with their top team winning the first three boards to down Lincoln High School by a score of 3 to 2. Their second team did even better winning the top 4 boards against Scio High School. Sherwood High School also had a good week by beating up Access Academy with their top team sweeping Access’ #2 team by a score of 5 to 0 and their second team winning 3 to 1 against Access’ third team (both teams forfeited 5th board). Westview and LaSalle were tied 2 to 2 with the third board still hanging in the balance. It ended up as a time scramble with both sides having their chances slip away until an error on the part of Alex Peterson allowed Adarsh Bhatt to steal the win and give Westview the match. Wilson had to play one board short but still prevailed over LaSalle #2 by a score of 4 to 1. Wilsonville insured a bad week for Cleveland High School by beating their second team by a score of 4 to 1. Lake Oswego #2 sweep Jesuit #2 by a score of 4 to 0 (with both teams forfeiting board 5). Access Academy’s middle schoolers’ embarrassed Clackamas’ second team by only yielding a single draw. LaSalle team won by forfeit when Wilson’s #2 team did not make an appearance. It’s not too late for individuals to join the League. If you’re in grade 6 to 12 and would like to join the League, contact Ed Addis at chessalot@aol.com. The top 25 list is substantially has advanced substantially since October. The average rating has increased nearly 30 points, from 1613 in October to 1641 today. To earn a spot on the list in October, you would need a rating of 1465, but bottom of the list has increased by 23 points to 1488. — Alexandra Botez (2037) once again tops the list by a large margin. — The next seven players are closely matched and rated right around 1800. — Two players have moved into the 1600s (none in October). — Austin Nguyen picked up nearly 100 points but remained at number 10. — Erik Skalnes is in Europe this year, but he played in a two FIDE events in Portugal and picked up 158 points to move up to #2. — Rory Soiffer played great at All-Stars and picked up 133 points to crack the top 25 for the first time. — Aaron Grabinsky and Dillon Murray have both been on a tear lately and have picked up over 100 points since October. Aaron moved into the top 10, while Dillon moved from number 25 clear up to number 12. — There are four Corvallis players in the top seven. — Only 12% of the players have first names that start with letters in the last half of the alphabet. This is a clear improvement over October, when it was only 7.7%!